Nearly three years ago, the Magazine reported on the Finnish baby box - a starter kit of clothes, sheets and toys the state gives to expectant mothers. The story went viral and was read by 10 million people in 18 months. Now the box idea itself is spreading around the world. It's a tradition that dates back to the 1930s. Every new mother, regardless of background or income, gets a baby box from the government. The box contains a stash of supplies - bibs, bodysuits, nappies, a sleeping bag, outdoor gear, bathing products - as well as a small mattress. Putting the mattress in the bottom of the box creates the baby's first bed. It has been credited with helping Finland achieve one of the world's lowest infant mortality rates. More publicity for the idea quickly followed when the Finnish government gave a baby box to the Duke and Duchess of Cambridge, who were then expecting their first child. Soon afterwards, three fathers in Finland set up a business to supply boxes to customers all over the world. Two women in the US did the same thing. There is now a similar business in the UK, and there may be others elsewhere. It was such a simple idea, and apparently so effective, that health professionals and social entrepreneurs also wanted to put the box to the test, in some cases teaming up with one of these private suppliers. Often the contents of the box or the way it is distributed are designed to address local problems, from preventing infection to getting the baby out of the parents' bed, where there may be a risk of suffocation. And in some cases one of the key goals is - as it was in Finland in the early days - to encourage expectant mothers to attend antenatal clinics. Two South African entrepreneurs, Ernst Hertzog of Action Hero Ventures and marketing executive Frans de Villiers, concluded that a plastic box, that can be used as a bath rather than a bed, was more useful for South African mothers. But the main objective was to get mothers to antenatal classes, and a trial carried out by the Research on Socio-economic Policy Health Group at Stellenbosch University last year concluded that the Thula Baba Box, as it is known, encourages mothers to attend clinics at an earlier stage of pregnancy, and to attend more frequently. Among other things, this reduces the risk of an HIV-positive mother dying in childbirth, and reduces the risk of HIV being passed from the mother to the baby. De Villiers and Hertzog are keen for the project to be rolled out across the Western Cape region, and hope that it may one day become a national programme. A doctoral student at Harvard University, Karima Ladhani, had a similar idea about adapting the Finnish box for use in South Asia. She developed the Barakat Bundle project (Barakat means "blessing" in some regional languages) which has now swung into operation at a rural hospital in Jagadiya, India. The box includes a clean-birth kit to prevent infection during or soon after delivery and a mosquito net to protect babies against malaria. But it's not just in developing countries where infant mortality is a concern. A pilot baby box project is being launched this month at Queen Charlotte's and Chelsea Hospital in London, in collaboration with the US company, Baby Box Co, which says the education component of its programmes is "crucial" to their success. "We take it for granted people have money for a separate sleeping cot or Moses basket but that might not be the case," says Karen Joash, the consultant obstetrician and gynaecologist behind the plan. She also thinks the box will enable mothers to keep the baby in the same room with them, because it is so easy to carry, "which is good for bonding," she says. About 600 boxes will be given to all women who give birth at the hospital over the next few months. There are dozens of projects under way in US states, but the biggest will launch later this year in Fort Worth, Texas, when all four of the city's hospitals start handing out baby boxes in an attempt to bring down the high infant mortality rate of 7.1 per 1,000 births in 2013. This compared to 5.9 per 1,000 births in the US as a whole. About 36,000 boxes are expected to be handed out over the next two years. Here a key objective is to encourage parents not to sleep alongside their babies, in the same bed. "We realised the community wasn't aware infant mortality was a big problem here," says Dyann Daley, of Cook Children's Hospital System. "Our goal is to provide a box for every live birth in the city and give babies a safe sleeping environment because that is critical to preventing suffocation deaths." A baby box project is also about to get under way in Australia, in the state of Victoria, and the province of Alberta in Canada has been running a pilot project since October 2015. Karen Benzies, a professor of nursing at the University of Calgary, says the original intention was to target vulnerable families, but they soon realised "the idea of vulnerability that most people have around low income doesn't necessarily hold true in Alberta". It's a province that has done well out of the oil and gas industry, but when men stay away working on oil rigs for weeks at a time, that creates a different kind of problem - as new mothers are left alone with a new baby. "Our goal is to support first-time families transitioning from pregnancy to parenting," says Benzies. A key element of this is mentoring. Every mother and father has to identify a mentor who agrees to be in contact - via phone or in person - about 20 times from when the mother is 32 weeks pregnant to six months after the birth. "We find in Canada that family and friends see a problem, but don't want to, or are told not to, interfere," says Benzies. "And we wanted to change that." So far about 50 boxes have been distributed, with 1,500 more ready to go. Another innovation in the Canadian boxes is a "crib-side assistance" booklet for fathers, to encourage them to bond with the child. Modelled on a car-repair manual it provides a do-it-yourself guide to burping ("You know how good it feels to burp sometimes?") underlines the importance of "fuel" (mother's milk) and explains how to "look under the hood" for those inevitable nappy problems, because "keeping your new model clean and comfortable is important". The Finnish government says it is aware of the global interest in their baby boxes and often provides consultation to other countries. It now gives presentations at embassies around the world. But not everyone is convinced the box is the best way forward. 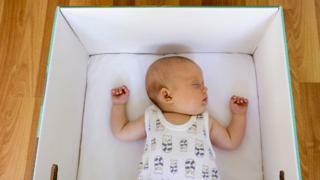 Colin Pritchard, a professor at Bournemouth University who has studied child and infant mortality, says the box system makes some "theoretical sense", as it provides the baby with somewhere to sleep other than the parents' bed and could therefore reduce the number of deaths linked to suffocation. But he believes the effect will be marginal. Alleviating poverty, stopping parents smoking, and improving education and antenatal care - all these things are more fundamental, he argues, in tackling the problem of infant mortality.